The following are the Terms and Conditions for the use of smsgatewayhub.com Service ("smsgatewayhub.com Service" or "the Service") by the User ("user" or "client"). Any user availing this service shall invariably be bound by these Terms and Conditions. IMPORTANT: In accordance to the Information Technology Act, 2000 (Government of India) and the common law of contract, these Terms and Conditions are valid, binding and enforceable for all persons that access the smsgatewayhub.com website, the web pages or any part thereof. Hence, if you do not agree to be bound over by these Terms and Conditions then you may not use the smsgatewayhub.com website. The reasonable use of the smsgatewayhub.com website shall automatically bind the user to this agreement. You may please note that user has to agree to all the Terms and Conditions relating to this service agreement, and that user consents to be bound by and becomes a party to this service agreement from the moment he/ she places smsgatewayhub.com's products on a website or /and accesses any part of the smsgatewayhub.com service. The smsgatewayhub.com website includes all of www.smsgatewayhub.com, including any page, part or element thereof, which is owned and operated by Hex Wireless. All the specified fees are payable upfront, prior to credits being activated. smsgatewayhub.com will make no guarantees for the uninterrupted and continuous availability of the Service or of any specific feature(s) of the Service. smsgatewayhub.com reserves the right to change or terminate the Service and/ or alter the Terms and Conditions of this Agreement at any time with/without notice and/or with immediate effect. All the fees paid to smsgatewayhub.com when such termination occurs are addressed in detail in the sections below. Messages will be considered as delivered when smsgatewayhub.com has delivered, or sent the messages to the immediate destination that smsgatewayhub.com's software has been programmed to do, which includes SMTP servers, or Mobile telephone networks. In addition, any other intermediary server or API is also deemed to be the point of dispatch of the message. smsgatewayhub.com does not extend guarantee of delivery on behalf of the Mobile telephone networks of mail servers. smsgatewayhub.com lays no claim to its network coverage. Although smsgatewayhub.com focuses on giving extensive coverage aggregation services, the mobile networks may choose from time to time to not be a part of smsgatewayhub.com or of its service providers' networks. This may lead to messages not being delivered. 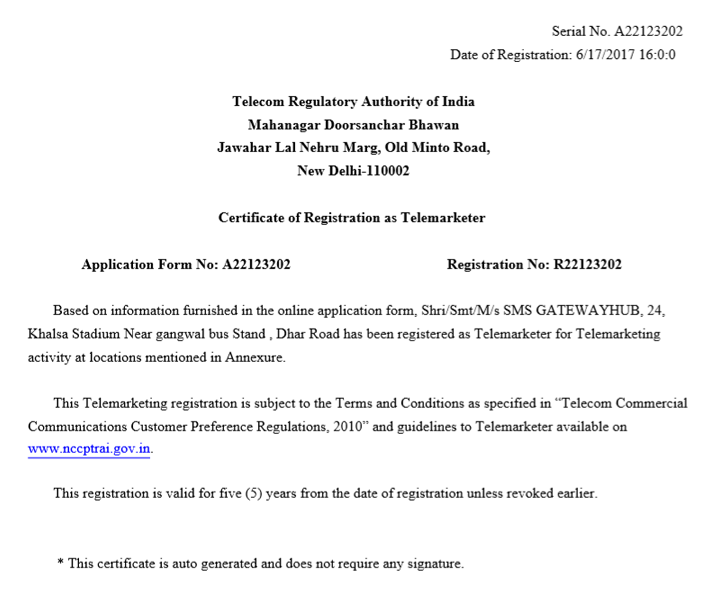 Subject to the Terms and Conditions of this Service Agreement and Laws of the Union of India, smsgatewayhub.com grants the User an individual, personal, non-sub licensable, non-exclusive and non-transferable license ("the License") for the use of its proprietary software and also /or application service, in object code form only, and only in strict accordance with the applicable end user documentation, if any, and only in conjunction with the smsgatewayhub.com Service Agreement. The User is not permitted, directly or indirectly, to reverse engineer, de-compile, disassemble or otherwise make any attempt to establish the source code or the underlying ideas or algorithms of the software; to modify, translate, or to create distinctive and derivative works based on the software/ application; or to copy (except for archival purposes), to rent, lease, to distribute, assign, or otherwise transfer rights to the software/application; to use the software/application for timesharing or service bureau purposes or otherwise to the benefit of a third party; or to remove any proprietary notices or label/s that identify smsgatewayhub.com products and/or services. As between the parties, the User will acknowledge that smsgatewayhub.com and its licensors retain ownership of all the propriety applications, software, intellectual property "IP" (Intellectual Property) and any portions or copies thereof in relation to them, and all rights therein. Upon the termination of this Service Agreement for any reason, this License will be terminated and the User shall destroy and cease using all the software and applications. This software is provided and the applications are offered, "AS IS" and are subject to the disclaimers of warranty and the limitations of liability as found in this service agreement and which is subject to testing by the client or the user before entering into this agreement. To open an account for the usage of Service, it is essential that the User must complete the registration process by providing all current, complete and accurate information as will be prompted by the Registration Form. Entering inaccurate details will result in suspension. The User has to choose a login name. The user password will be sent to his email id that he had provided in the registration form. The User is to be entirely responsible for maintaining the confidentiality regarding his password and account information. In addition, the User will be entirely responsible for any and all activities that will occur under its account. smsgatewayhub.com will not be held liable and respond to any third party claims and or actions taken with respect to services offered. The User agrees to notify smsgatewayhub.com immediately regarding any unauthorized use of its account or of any other breach of security. smsgatewayhub.com 's service normally transmits its own brand name or gateway number as the Sender's name for each of the messages that the end-user sends. The User agrees that smsgatewayhub.com can access its account, including the contents, as stated above or to respond to the service or the technical issues. 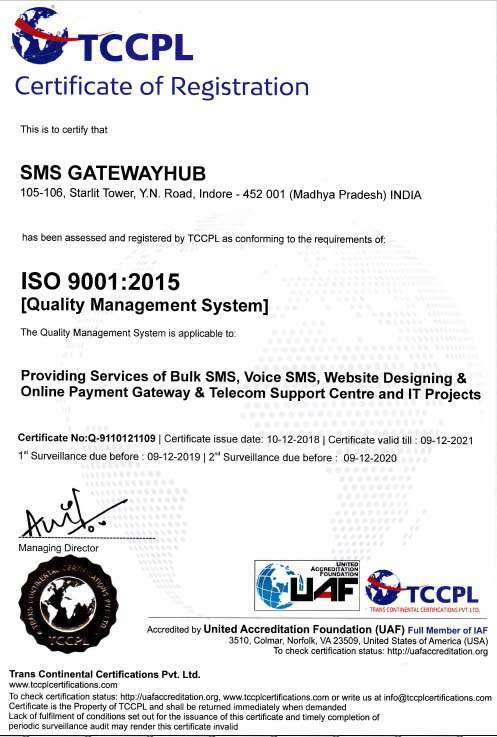 The User hereby permits smsgatewayhub.com to send him communication via e-mail/SMS of any updates, upgrades, notices, or any other information that smsgatewayhub.com deems important for the user to know, relating to the service. It is to be clearly understood that smsgatewayhub.com assumes no responsibility for any deletion or for any failure to store information. smsgatewayhub.com has not fixed an upper limit on the number of messages a User may send through the Service. This is apart from how many credits are left in the User's account; however, smsgatewayhub.com reserves to itself the right, at its sole discretion, to determine whether or not any or all Users conduct is consistent with the letter and spirit of the Service Agreement. It may terminate the Service if the User's conduct is found to be inconsistent with the Agreement. Please refer to the detailed procedure for termination of the service. smsgatewayhub.com has the right and may, in future, after prior or without prior notification, limit the storage space that may be available to each User. Although smsgatewayhub.com makes all efforts to ensure delivery and prides itself on fast delivery of messages, messages may be delivered late as a result of queuing or network traffic. This situation will still result in displaying the message as "delivered". J. Engage in any other activity that smsgatewayhub.com could believe may subject it to criminal liability or civil penalty or judgment. A. In consideration for the use of smsgatewayhub.com's services, the User agrees and shall pay to smsgatewayhub.com a sum called a transaction fee or subscription fee (as appropriate) for messages delivered or partially delivered using any available delivery method, at the prescribed and applicable rate then in effect. smsgatewayhub.com may, from time to time, and at its own discretion, offer limited time "Free Trial" or similar type or different promotions during which period no transaction fees or reduced transaction fees may apply. Such promotions are intended for Users to test the capabilities of the Service and/or for casual, personal use only. During such promotions, all provisions of this Agreement shall remain in full force and effect. B. All fees are payable upfront. Upfront payment refers to payment that is made within a reasonable time so as to allow smsgatewayhub.com to add the SMS credits to the client's account. C. Payment shall be deemed to have been made, as soon as the fee is available in smsgatewayhub.com's bank account. · Cheque / Demand Draft / Cash deposit into our Bank Account. E. Credit Card Payment - If the User has elected to pay for the Service by credit card, and smsgatewayhub.com does not receive payment from the credit card issuer, the User agrees to pay all amounts due, immediately upon demand by smsgatewayhub.com. All amounts are pre-paid and the User agrees to the payment and to the Terms and Conditions of such payment whenever such payment is made. smsgatewayhub.com reserves the right to give its agreement to other payment arrangements on a case-by-case basis. (Agreements with the credit card issuer govern use of the User's credit card, and the User must refer to that agreement to ascertain its rights and liabilities as a cardholder). The User is charged in US Dollars. The final purchase amount is the amount reflected on the Credit Card holder's statement. F. Cost Increase - The User acknowledges that smsgatewayhub.com is dependent on various telecommunication networks and institutions for the delivery of its messages and that smsgatewayhub.com may revise its prices and offerings for its products and services, should the prices be adjusted due to reasons, which are beyond smsgatewayhub.com's control. 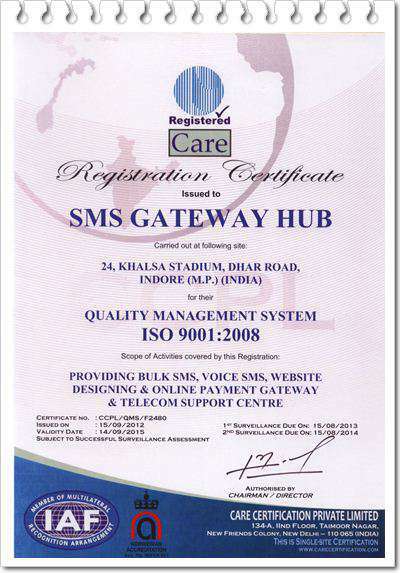 smsgatewayhub.com undertakes to notify the clients and users of such adjustments in writing, prior to implementing such adjustments. G. Any message units that have been purchased must be used up within 120 days from the date on which it had been purchased. smsgatewayhub.com may, at its sole discretion, curtail or extend this period on a case-by-case basis. H. No refunds will be made in any case for any fees already collected like branding fees, licenses, monthly administration fees, and any other setup or onetime fee that the User may pay to smsgatewayhub.com. I. Before starting any relationship with us we advice you to test our services. We do not offer any refund of money at any stage or at any condition once the transaction has done unless smsgatewayhub agreed. In case, smsgatewayhub agreed to refund money it will take 60 to 90 days but not more then that from the date of request received by smsgatewayhub through e-mail (registered with the smsgatewayhub) or by regular post. All charges like monthly fee (pro-rata basis), sms charges (for unused credits), 15% processing charges will be deducted from the refundable amount. K. The User expressly understands that rate, calculated by the number of credits to specific destination network may change due to various factors, and that smsgatewayhub.com may adjust these credits whenever it deems it necessary to do so, with or without prior notice to the User. A. Modification of Terms - smsgatewayhub.com frequently updates, modifies, and otherwise continually makes efforts to improve all the smsgatewayhub.com services and products. Such changes often dictate that we simultaneously modify our Terms and Conditions of Use. Hence, smsgatewayhub.com shall have the right to modify any or all the terms of this Agreement and to change or drop any aspect or feature of the smsgatewayhub.com service, in either case, as it deems reasonably necessary. Such changes shall be effective immediately upon posting of such addition, change, or deletion. Any use by the User of the Service after any such change has been posted shall be construed as the acceptance of any such changes. If the User is not agreeable to any such changes, the Service may be canceled in accordance with the procedures for cancellation set forth in this Agreement. The User acknowledges its responsibility to read and review this Agreement from time to time and also to be aware of any such changes. B. Termination, Cancellation and/or Suspension by smsgatewayhub.com - This Agreement and the license granted hereunder can be terminated, canceled and/or suspended by smsgatewayhub.com at any time if, in smsgatewayhub.com's sole discretion, the User has breached the Terms of Service. Such termination, cancellation and/or suspension by smsgatewayhub.com shall come into effect immediately after giving notice by smsgatewayhub.com to the User in any reasonable manner, including but not limited to, notification by e-mail. Upon, during, and/or after any such breach, smsgatewayhub.com has the option to suspend, terminate and/or cancel this Agreement. In addition, smsgatewayhub.com has the right to recover any and all damages from the User arising from or relating to the event(s) giving rise to the suspension, termination or cancellation. smsgatewayhub.com reserves the right to suspend the client's service at any stage for any reason that it may deem necessary in order to continue to provide any of its services in a way that may be hindered by the Client's status as being a smsgatewayhub.com client, or the financial status of the client or the content of the messages originating from the client. C. In the event that smsgatewayhub.com has cause to receive complaints from recipients or third parties with respect to the use of the Service, smsgatewayhub.com additionally reserves the right, in its sole discretion, to disclose any and all information to the recipient, applicable authorities or any other party with regard to its clients and application Users. D. Termination or Cancellation by the User - The User has the right and is free to terminate or cancel this Agreement at any time and for any reason. The User only has to intimate smsgatewayhub.com by sending an email of this intention. However, it is to be noted clearly that any sum or pre-paid credit amount remaining pending at the time of cancellation of this Agreement shall not be repaid to the User. E. Obligations Upon Termination and/or Cancellation - Upon the termination, cancellation and/or suspension of this Service Agreement, the User remains responsible for any obligations that have been accrued including, but not limited to, payment of any costs or charges that may be arising in connection with such termination, cancellation and/or suspension, and payment of all outstanding transaction fees for use prior to said termination, cancellation and/or suspension occurs. The payment and other obligations under this Service Agreement are not suspended, stayed, or otherwise affected by a suspension of access to / or use of smsgatewayhub.com (in whole or in part) where the said suspension arises from the User's failure to comply with, or violation of, the terms of this Service Agreement or of any law or legal obligation. Upon termination and/or cancellation, for any reason, the User agrees to immediately cease using smsgatewayhub.com and removes all the smsgatewayhub.com software and the applications on any computer, database, and the server (local or remote) in its possession or under its control. smsgatewayhub.com shall have no obligation whatsoever to the User after the termination or cancellation of this Service Agreement. A. While it is to be understood that smsgatewayhub.com will make all efforts to ensure that the service is reasonably available at all times, and will at all times endeavor to maintain connections to as many aggregators, gateways and Carriers as are, in its discretion, commercially viable and to make all upgrades to the smsgatewayhub.com API available to the User in a commercially reasonable and timely manner. The User acknowledges that smsgatewayhub.com cannot guarantee the availability of a Carrier's SMSC. The user expressly acknowledges and agrees that the use of the service is generally at its own risk and that smsgatewayhub.com's service is being provided "AS IS" and "AS AVAILABLE" without any warranties or conditions whatsoever, express or implied. smsgatewayhub.com will use commercially reasonable efforts to make the access to its services always available to the user through the required access protocols, but makes no warranty or guarantee that the user will be able to access smsgatewayhub.com at any particular time or any particular location. B. smsgatewayhub.com (which also includes its owners, employees, suppliers, internet service providers, partners, affiliates and agents) shall not be held liable for any damage, loss or liability of any nature incurred by whomever and resulting from use of the service and the internet generally, as well as access to the smsgatewayhub.com website, the access to websites linked to the smsgatewayhub.com website, any inability to access the smsgatewayhub.com website; the inability to access websites linked to the smsgatewayhub.com website, any content available on the smsgatewayhub.com website, any or all services available from the smsgatewayhub.com website, any or all products available from the smsgatewayhub.com website, any downloads and use of content from the smsgatewayhub.com website, and/or any other reason which is not directly related to smsgatewayhub.com's gross negligence. C. The information, ideas and opinions expressed on the smsgatewayhub.com website should not be regarded as professional advice or the official opinion of smsgatewayhub.com, and Users are strongly encouraged to consult professional advice before taking on any course of action that is related to the information, ideas or opinions expressed on the smsgatewayhub.com website. D. smsgatewayhub.com does not make any warranties or representations that the smsgatewayhub.com website shall be available at all times. Users acknowledge that the smsgatewayhub.com website may be unavailable due to updates or other causes beyond the reasonable control of smsgatewayhub.com, including, but not limited to virus infection, unauthorised access (hacking), power failure or other "acts of God". E. smsgatewayhub.com does not make any warranties or representation that the content and the services available from the smsgatewayhub.com website shall in all cases be true, correct or free from any errors. 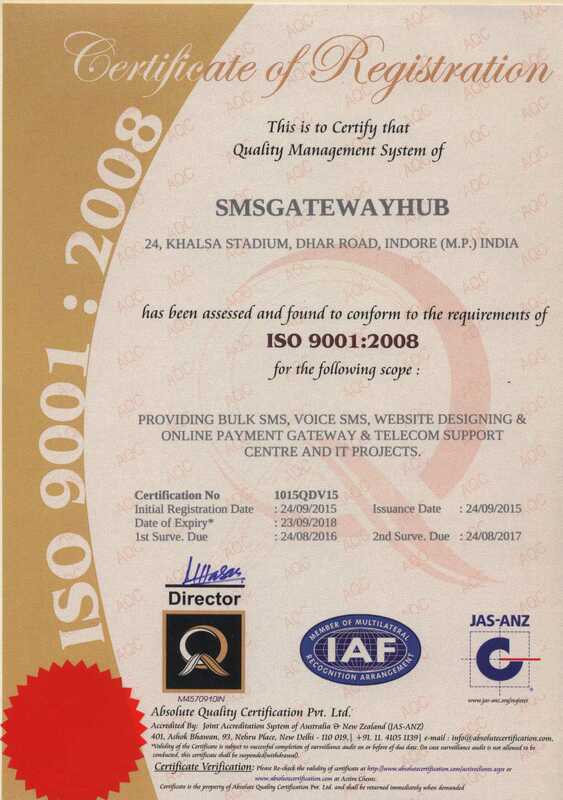 smsgatewayhub.com shall take all reasonable steps to ensure that the quality and accuracy of content is available from the smsgatewayhub.com website. a) Hereby disclaim all express and implied warranties as to the accuracy, completeness, non-infringement, merchantability or fitness for any or all particular purposes of smsgatewayhub.com generally, and that any content or services contained therein, as well as all the express and implied warranties that the operation of smsgatewayhub.com is generally and that any content or services contained therein will be uninterrupted or error-free. b) Shall in no event be held liable to the user or anyone else for any inaccuracy, error or omission in, or loss, injury or damage caused in whole or in part by the failures, delays or interruptions of the service generally, and any aspect ancillary thereto; (the user agrees to indemnify smsgatewayhub.com for any and all third party claims arising from any such or of the failures, delays or interruptions in connection with regard to use of the service). G. Without in any way limiting the foregoing, smsgatewayhub.com shall in no event have (in the aggregate) any liability whatsoever in connection with this agreement in excess of an amount that is equal to twice the lowest monthly transaction fee applicable to such account and /or claim in effect for the monthly period immediately preceding the date of the first claim made by the user and/or the user alleging liability. H. High risk activities - The smsgatewayhub.com service is not fault-tolerant and is not designed, manufactured or intended for use or resale as online control equipment in hazardous environments requiring fail-safe performance, including but not limited to use in the operation of nuclear facilities, aircraft navigation or communication systems, air traffic control, direct life support machines, or weapons systems, in which the failure of smsgatewayhub.com could lead directly to death, personal injury, or to severe physical or environmental damage ("high risk activities"). In addition to all the other disclaimers and limitations contained within this agreement, smsgatewayhub.com and its affiliates, agents, content providers, service providers and licensors specifically disclaim any express or implied warranty of fitness for high risk activities which may also include emergency notification services. Notwithstanding anything to the contrary contained herein, the provisions for the " Warranties and Liabilities" set forth in Section 10 herein are for the benefit of smsgatewayhub.com and its affiliates, agents, content providers and service providers and each shall have the right to assert and enforce such provisions directly on its own behalf. The User agrees to indemnify, hold harmless, and defend smsgatewayhub.com and its affiliates, agents, content providers and service providers, against any and all claims, liabilities, damages, all costs and expenses (including, but not limited to, consequential damages, incidental damages, special damages, attorneys' fees and disbursements) arising from or relating to (i) the use of the Service in any manner which violates the terms of this Service Agreement or otherwise violates any law, rule, or regulation and (ii) any claims made by third parties arising from your use of the Service, including without limitation any and regulation all third party claims arising from or related to any failure, delay or interruption to the Service. The User agrees to cooperate as fully as reasonably required in the defence of any claim. smsgatewayhub.com reserves the right, at its own expense, to assume the exclusive defence and control of any matter otherwise subject to indemnification by the User. No agency, partnership, joint venture, or employment is said to be created as a result of this Service Agreement and the User does not have any authority of any kind to bind smsgatewayhub.com in any respect whatsoever. In any action or proceeding to enforce rights under this Service Agreement, the prevailing party will be entitled to recover all the costs and attorneys' fees. These Terms and Conditions constitute the whole agreement between smsgatewayhub.com and the User and neither party shall be bound by any undertakings, representations, warranties, promises or the like not recorded herein. smsgatewayhub.com offers the facility for individuals or businesses to connect to its server in order to facilitate text messaging directly to smsgatewayhub.com's Gateway. These terms do not exclude the foregoing terms in this agreement. b) smsgatewayhub.com reserves the right to approve clients and API connections at its sole discretion. c) smsgatewayhub.com encourages the use and publicity of anti-spam policies. d) The client will be supplied with a unique login and password. This will ensure that the connection is at all times secure from smsgatewayhub.com's side. Security measures over and above this will be the client's responsibility. e) Although smsgatewayhub.com will provide API connection specifications and will attempt to keep the specifications accurate and up to date, these specifications may be incomplete and may change from time to time without smsgatewayhub.com informing the client that it has changed. 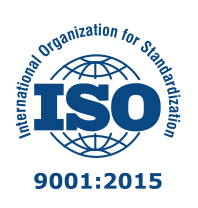 It is the client's sole responsibility to test the specifications thoroughly on a regular basis, since smsgatewayhub.com will not accept responsibility for any specifications that may be incorrect or incomplete. smsgatewayhub.com licenses the User to view, download, save and print the content of the smsgatewayhub.com website, provided that such content is to be used for private, personal, educational and/or non-commercial purposes only or to view, download, save and print this agreement for legal and/or evidential purposes. Content from the smsgatewayhub.com website may not be used or exploited by Users for any commercial and non-private purposes without the express and prior written consent of smsgatewayhub.com. · smsgatewayhub.com shall not be liable, in any manner whatsoever for any damage, loss or liability that may result from the use of such content by the User or by any third party who has obtained any content from the User. Hyperlinks to the smsgatewayhub.com website from any other source shall be directed to the home page of the smsgatewayhub.com website. Links beyond the smsgatewayhub.com home page may only be used with smsgatewayhub.com's prior written consent and permission. smsgatewayhub.com shall not be liable, in any manner whatsoever, for any damage, loss or liability that results from the use of content, products or services available from the smsgatewayhub.com website and if such content, products or services was accessed through a hyperlink not directed at the home page of the smsgatewayhub.com website. Persons that wish to link to pages beyond the home page of the smsgatewayhub.com website without smsgatewayhub.com's prior written consent shall do so at their own risk and indemnify smsgatewayhub.com against any loss, liability or damage that may result from the use of such hyperlinks. smsgatewayhub.com's non-liability for deep linking is based on the fact that deep links bypass these Terms and Conditions. Users may quote small and reasonable amounts of content available from the smsgatewayhub.com website and only if such a quote is placed in inverted commas and the source is acknowledged. No person may, without the prior written consent and permission of smsgatewayhub.com, frame the smsgatewayhub.com website in any manner whatsoever. Apart from bona-fide search engine operators, no person may use or attempt to use any technology or applications (including web crawlers, robots or web spiders) to search, collect or copy content from the smsgatewayhub.com website for any purpose whatsoever, without the prior written consent of smsgatewayhub.com. E-mail addresses, names, telephone numbers and fax numbers published on the smsgatewayhub.com website cannot be incorporated into any database, used for electronic marketing or similar purposes. No permission is given or is implied that the information on the smsgatewayhub.com website may be used to communicate unsolicited communications to smsgatewayhub.com. All the licenses and/or permissions that are granted in terms of this section are provided on a non-exclusive and non-transferable basis and may be terminated or cancelled by smsgatewayhub.com at any time without prior notice or giving any reasons. smsgatewayhub.com shall take all reasonable steps to secure the content of the smsgatewayhub.com website and to secure the information provided by and collected from Users to prevent unauthorised access and/or disclosure. However, smsgatewayhub.com does not make any warranty or representation that the said content shall be 100% safe or secure. smsgatewayhub.com is under no legal duty to encrypt any of the content or communications from and to Users and is also under no legal duty to provide the digital authentication of any pages on the smsgatewayhub.com website. Users are not permitted under any circumstance to deliver or attempt to deliver, whether deliberately or negligently, any damaging code, such as computer viruses, robots or spy ware, to the smsgatewayhub.com website or the server and computer network that supports the smsgatewayhub.com website. Notwithstanding criminal prosecution, any person who delivers or attempts to deliver any damaging code to the smsgatewayhub.com website, whether deliberately or negligently, shall, without any limitation, indemnify and hold smsgatewayhub.com harmless against any and all liabilities, damages, risks and losses that smsgatewayhub.com and its partners/affiliates may suffer as a result of such delivery, attempt or damaging code. Users are not permitted to develop, distribute or use any device or programme designed to breach or to overcome the security measures of the restricted pages, the products and the services on the smsgatewayhub.com website. smsgatewayhub.com reserves the right to claim damages from any and all persons involved, directly and indirectly, in the development, use and distribution of such devices or programmes. Users who commit any of the above offences shall, notwithstanding criminal prosecution, be held liable for all resulting liabilities, losses, destruction or damages that may be suffered and/or incurred by smsgatewayhub.com and its partners/affiliates as a consequence or related to these illegal actions.